The J.W. Jones award is awarded every two years to the author(s) of a written paper presented to a Branch technical meeting which best meets the award criteria (available from the Guild) Among the aims of this award is the encouragement of younger authors, although no age limit is imposed on authorship. The award is made in the honour of the eponymous founder of the Guild and its first Chairman, who died in 1971. 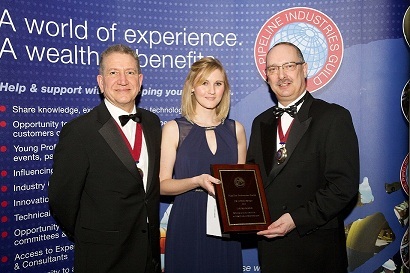 Left to Right: Steve Wayman (Wood Group Kenny and Past President of the Guild), Laura Mann (Wessex Water) and John Ineson (Sweett Group and Past Guild Chairman).